There are plenty of places to watch the inauguration today online (see our guide). I’ve been clicking around, and many of the streams are jittery, as you would expect, but I find myself coming back to CNN’s live stream. The video keeps skipping on me, but at least the audio is consistent. Maybe that’s because CNN.com is serving a record number of live video streams (13.9 million live streams between 6 AM and 11:45 AM ET, versus 5.3 million on Election Day, the previous record. See update below). The big draw, however, is that CNN partnered with Facebook, and I can watch the proceedings along with comments from all my Facebook friends in the sidebar. Watching events like these with people you know is always better than watching alone, but since most of us are at work today, Facebook serves as a proxy for a virtual living room that can hold hundreds of people. I find these comments much more interesting than random Twitters from people I don’t know. 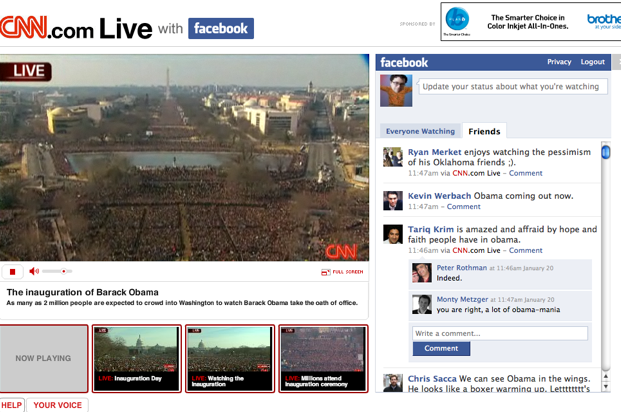 So I am going to stick with Facebook and CNN for the rest of the inauguration ceremony. (Uh-oh the stream just went completely kaput for me—at least I can still read everyone’s commentary. 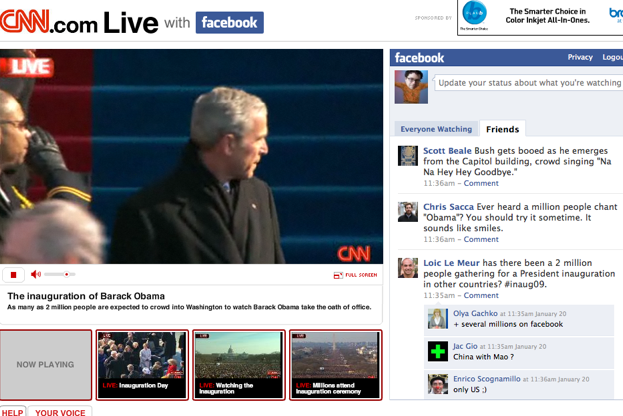 I’m switching to Hulu for the live video). And CNN served more than 18.8 million live streams between 6 AM and 1 PM EST, with a peak of 1.3 million streams just before Obama began his speech. Update 3: Make that 21.3 million streams on CNN.com as of 3:30 PM EST and 136 million pageviews.